Perhaps not quite as critical to existence as burritos, but still very important are tacos. As you can see, these tacos are small, double layered corn tortillas served flat. It's up to you to fold them up for a bite. The tacos above are a variety of meats. This is one of the great things about tacos, you can get a whole variety of flavors. The meats above are Carne Asada, Carnitas, Cabeza, and Chorizo. All of these are excellent options, though my favorite is the Chorizo. Perhaps the most adventurous option for the non-initiated is the Cabeza. For those not familiar with the meaning of this word, cabeza is Spanish for head. This may include a variety of meats from the head of the cow. This meat was soft and a little on the gelatinous side, but very flavorful. 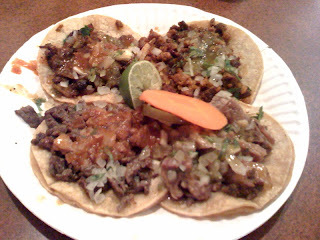 These tacos are from El Charrito in San Carlos, California. Want to have a great meal for VERY little money? You gotta try this place. Each taco, while small, is only a little more than a dollar. A couple tacos (or four) and a horchata, and I'm a happy man.